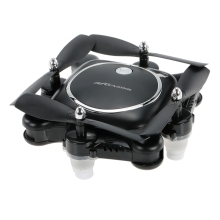 RC118 Wifi FPV quadcopter is equipped with 720P HD aerial camera, but with small size and foldable design, it is very portable and easy to carry. This drone is built-with an optical flow sensor, which stands out in accurate hover and stable indoor flight. Great choice for RC fans. 720P camera with Wifi real-time transmission FPV system, allows you to get great selfies effortlessly and record remarkable moments. Optical flow sensor, provides stable flight and accurate hover.